The ovarian hormones estrogen and progesterone orchestrate postnatal mammary gland development and are implicated in breast cancer. Most of our understanding of the molecular mechanisms of estrogen receptor (ER) and progesterone receptor (PR) signaling stems from in vitro studies with hormone receptor-positive cell lines. They have shown that ER and PR regulate gene transcription either by binding to DNA response elements directly or via other transcription factors and recruiting co-regulators. In addition they cross-talk with other signaling pathways through nongenomic mechanisms. Mouse genetics combined with tissue recombination techniques have provided insights about the action of these two hormones in vivo. It has emerged that hormones act on a subset of mammary epithelial cells and relegate biological functions to paracrine factors. With regards to hormonal signaling in breast carcinomas, global gene expression analyses have led to the identification of gene expression signatures that are characteristic of ERα-positive tumors that have stipulated functional studies of hitherto poorly understood transcription factors. 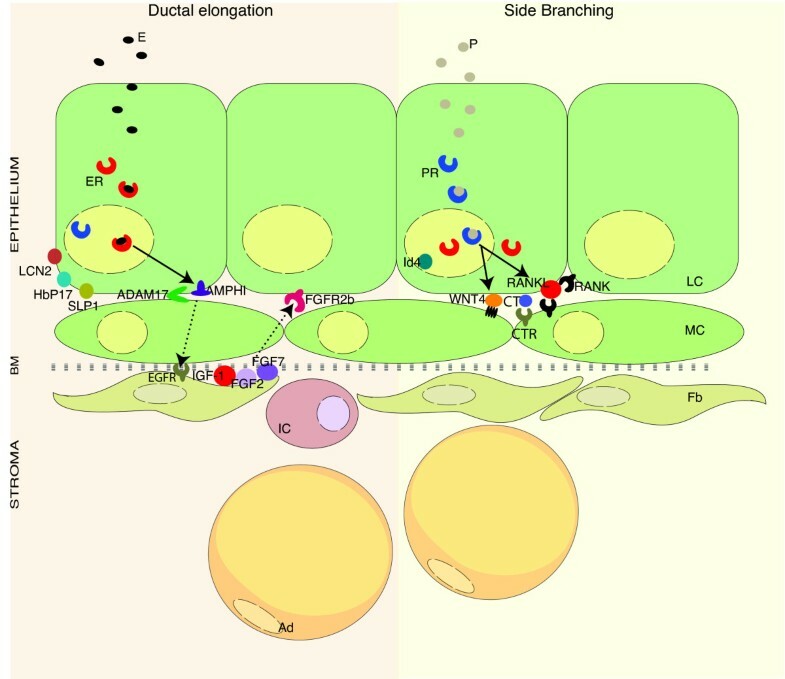 Here, we highlight what has been learned about ER and PR signaling nodes in these different systems and attempt to lay out in which way the insights may converge. The ovarian hormones estrogen and progesterone play pre-eminent roles in the female reproductive system and orchestrate postnatal mammary gland development in conjunction with pituitary hormones and other factors . Both estrogen and progesterone can interact with membrane receptors [2, 3]. Yet most of their known biological functions are mediated by their binding to and activation of the ligand-dependent transcription factors, estrogen receptor (ER) and progesterone receptor (PR). ER and PR are members of the nuclear hormone receptor (HR) superfamily; they contain structurally conserved and functionally distinct domains that include a central DNA binding domain, a ligand binding domain close to the COOH terminus, variable NH2-terminal domains related to transcriptional activation/repression and the well-characterized transcriptional activation domains AF-1 and AF-2 . Specifically, AF-1 is an NH2-terminal ligand-independent transcriptional activator whereas AF-2 is a ligand-dependent activation domain located in the ligand binding domain, which regulates transcription by association with transcriptional co-regulators [4–6]. There are two ERs (ERα and ERβ) encoded by distinct genes on different chromosomes and two known isoforms of PR (PRA and PRB) transcribed from the alternate usage of different promoters from the same gene . The breast epithelium consists of basal cells, mostly myoepithelial, and luminal cells. ERα and PR are expressed in about 30% of the luminal cells , while basal cells do not express the HRs. Two-thirds of all breast cancers are ER-positive , which means that ERα expression is detectable by immunohistochemistry in more than 1% of the tumor cells . HR status is a major biological parameter with important implications for prognosis and treatment. Interestingly, unsupervised clustering of global gene expression profiles of large sets of clinical breast cancer specimens reproducibly separates the tumors into ER-positive luminal tumors and ER-negative tumors [11, 12]. In vitro studies, with the ER-positive breast cancer cell line MCF-7, have revealed that in their unliganded state ERα and PR are in complexes with heat shock proteins [13, 14]. Upon hormone binding, the receptors dissociate from the heat shock proteins, dimerize and associate with DNA . The receptors can bind to DNA directly or indirectly, by physically interacting with other transcription factors such as AP-1, SP-1, STAT3, or NF-κB [16–19]. Both ER and PR recruit coactivators and/or co-repressors to elicit transcriptional changes . In addition to these so-called genomic mechanisms, steroids activate rapid signaling events that involve the generation of second-messenger molecules, for instance cAMP, and activation of signal transduction pathways in the cytoplasm , known as nongenomic mechanisms. Regulation of target gene expression by 17β-estradiol (E2) and progesterone is mediated by direct interaction of their nuclear receptors with co-regulatory proteins and components of the RNA polymerase II transcription initiation complex. Co-regulatory molecules can be functionally divided into coactivators and co-repressors (reviewed in ). Coactivators include SRC/p160 family members, E3 ubiquitin-protein ligases, p300/CBP and related proteins that possess enzymatic activities which modify histones to relax chromatin, thereby promoting transcription . Specifically, SRC and p300/CBP have histone acetyltransferase activity, whilst the E6-associated protein that interacts with both ER and PR has ubiquitin ligase activity . Co-repressors, such as N-CoR and SMRT, form complexes with deacetylases that modify histone tails, thereby stabilizing a more compact chromatin state. In addition, co-repressor complexes present high affinity for deacetylated histones, which further enhance the repression of ER and PR target genes . Nuclear receptor phosphorylation has been related to recruitment of coactivators/co-repressors. Different signaling pathways can affect specific interactions; phosphorylation of ERα is necessary for interactions of the receptor with certain coactivators while it reduces interactions with co-repressors (reviewed in ). Interestingly, receptor binding to coactivator can induce allosteric changes in coactivators enhancing the recruitment of other coactivators, consequently increasing receptor-dependent transcription. Nongenomic effects of ER/PR signaling include crosstalk with growth factor receptors and G-protein-coupled receptors in the cytosol (see Figure 1) within seconds to minutes after exposure to estrogens or progesterone. Ligand-bound receptors can initiate membrane proximal kinase cascades; for instance, ERα can activate Src-kinase leading to epidermal growth factor receptor (EGFR), mitogen-activated protein kinase (MAPK) and phosphatidylinositol-3-kinase signaling [26–31], whereas PR can trigger Src-MAPK and Akt signaling [32, 33] (Figure 1). Integration of genomic and nongenomic estrogen receptor and progesterone receptor signaling pathways. Estrogen receptor (ER) and progesterone receptor (PR) can bind directly to DNA-specific sequences or indirectly by binding to other transcription factors. 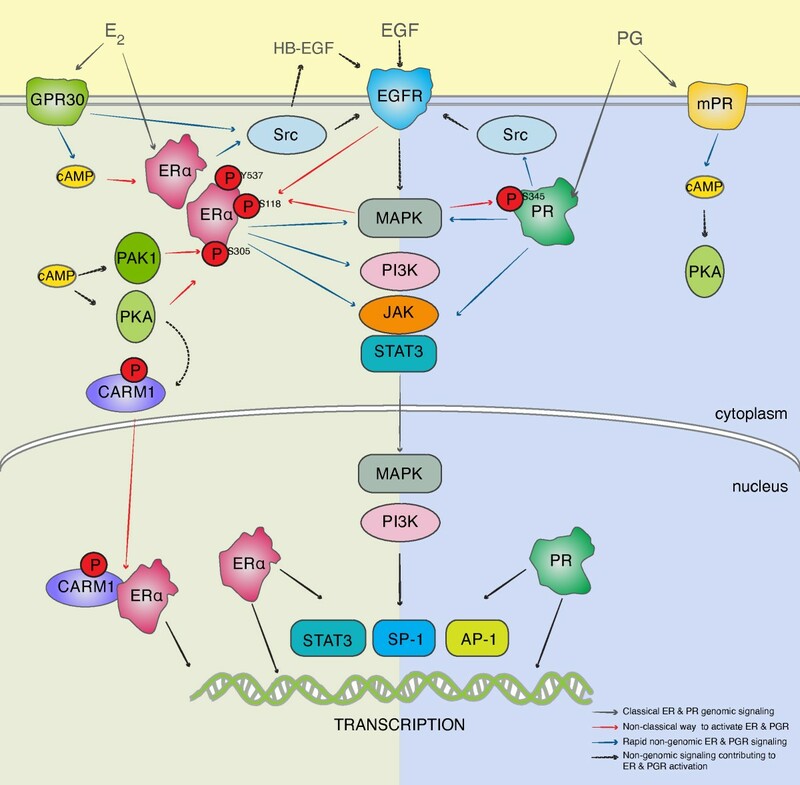 In addition, ERα and PR are able to activate several signaling pathways (mitogen-activated protein kinases (MAPKs), JAK/STAT, SRC or phosphatidylinositol-3-kinase (PI3K)) (blue arrows). In parallel, epidermal growth factor receptor (EGFR) activation by epidermal growth factor (EGF) or mediated by ERα activates MAPKs, which in turn can phosphorylate and probably activate ERα or PR. Protein kinase A (PKA) and PAK phosphorylate and activate ERα (red arrows). cAMP is involved in the activation of both ERα and PR receptors and can be induced by membrane receptors such as GPR30 or mPR. Besides, coactivators can participate in ERα activation by crosstalk with other signaling pathways; the coactivator coactivator-associated arginine methyltransferase-1 (CARM1) activates ERα by cAMP signaling, leading to ERα phosphorylation. Once phosphorylated, ER and CARM1 interact and can bind to the DNA to regulate target genes. E2, 17β-estradiol; HB, heparin-binding; PG, progesterone. At the same time, other signaling pathways impinge on ER and PR signaling by phosphorylating the receptors on multiple sites, thereby modulating their function [34, 35]. In particular, Ser-118 phosphorylation is important for ERα transcriptional activity . ER is phosphorylated in Ser-188 by MAPKs after EGFR activation by epidermal growth factor  or after estrogen stimulation . Other phosphorylation sites, such as Ser-305 and Thr-331, affect ER-coactivator interactions [38–40]. Besides, Thr-331 phosphorylation is required for nuclear localization and transcriptional activation of ERα . Not only serines and threonines are phosphorylated in ERα, but also tyrosine residues such as Tyr-537 that is a substrate for src family kinases and is required for the optimal ligand binding conformation of ERα . Interestingly, a single signaling pathway can activate HRs by several mechanisms. For example, protein kinase A can directly phosphorylate and thereby activate ERα , or can act through cAMP to activate ERα-mediated transcription . In addition, protein kinase A phosphorylates the coactivator-associated arginine methyltransferase-1, allowing it to interact with the ERα. This interaction, in turn is necessary for cAMP activation of ERα  (Figure 1). In the case of PR, the best-characterized phosphorylation sites are Ser-294, Ser-345 and Ser-400. Ser-294 phosphorylation is important for PR nuclear trans-location, ligand-dependent PR transactivation and the half-life of the receptor as Ser-294 phosphorylation targets the receptor for ubiquitination . A particularly interesting example of the complex crosstalk with tyrosine kinase receptor-driven signaling is the inter-action between PR and EGFR; progestins can activate EGFR, resulting in activation of c-Src and the downstream MAPK. This activation, in turn, leads to PR phos-phorylation on Ser-345 and activation of transcription . Besides, PR phosphorylation on Ser-294 has been implicated in PR ligand-independent activation of Src, and consequently Stat-3, resulting in increased proliferation of tumor cell lines . Phosphorylation on Ser-400 modulates ligand-independent transcriptional activities of PR. Cyclin-dependent kinase 2 can phosphorylate- on PR Ser-400 in the absence of progestins and is required for PR nuclear translocation in the absence of ligand . HRs can hence be activated in a ligand-independent fashion by multiple kinase cascades [48–51]. Nongenomic estrogen effects predominantly involve classical ERs residing in cytoplasm and at the cell membrane, where ERα can be found in direct association with palmitic acid . However, other membrane receptors for estrogens and progesterone acting through nongenomic mechanisms have been described and are reviewed elsewhere . With all ER and PR signaling converging on transcriptional regulation, the identification of target genes has long been of interest. Various global gene expression profiling studies identified between 100 and 500 E2-responsive genes (reviewed in ) and multiple PR targets [55–57]. More recently, large-scale detection of ER binding sites by chromatin immunoprecipitation (ChIP), initially combined with tiling arrays and more recently with deep sequencing, have established genome-wide maps (reviewed in ). These studies revealed more than 5,000 ER binding sites, of which only 4% were located in promoter regions. Most binding occurs at distant regulatory elements, suggesting very complex mechanisms of transcriptional regulation . Estrogens and progesterone play prominent roles in driving and coordinating postnatal mammary gland development. The mouse mammary gland offers unique experimental opportunities to genetically dissect signaling pathways involved in the development of this organ. In 3-week-old females, the inguinal gland can be cleared of its endogenous epithelium; any piece of mammary epithelium can then be engrafted into such a cleared fat pad and will grow out and recapitulate development . Comparison of HR-deficient and wild-type epithelia engrafted into contralateral cleared fat pads discerned that estrogens trigger expansion of the rudimentary ductal system into the mammary fat pad during puberty acting via epithelial ERα , whereas the epithelial PR is required in adulthood during estrous cycles and pregnancy to bring about side branching, thereby enhancing the complexity of the ductal system . When divested fat pads were reconstituted with ERα-/- or PR-/- epithelial cells mixed with wild-type cells the former contributed to all aspects of mammary gland development, establishing that the two hormones can act by paracrine mechanisms [61, 62]. HR-positive cells have thus emerged as sensor cells that act as mediators translating the systemic signals into local commands, thereby amplifying and prolonging the initial stimulus and coordinating the behavior of multiple cell types . Interestingly, HR-positive cells proliferate less than HR-negative cells [64, 65]. This has been attributed to negative regulation by transforming growth factor beta-1, which is specifically activated in the extracellular matrix of ERα-positive cells . ERα signaling is activated when estrogens are secreted by the ovaries with puberty. The EGFR ligand, amphiregulin (AREG), is the only EGFR ligand induced by estrogens in the pubertal mouse mammary gland and is an essential paracrine mediator of estrogen-induced proliferation that drives ductal elongation [67, 68] (Figure 2). AREG is a membrane-anchored protein and needs to be cleaved to be active [69, 70]. The metalloproteinase ADAM17 (TNFα-converting enzyme) is essential for this activation, as illustrated by studies showing that ADAM17-/- epithelium, like ERα-/- and AREG-/- epithelia, fails to grow out in a cleared fat pad but can be rescued by exogenous AREG . Control of mammary gland development by estrogen and progesterone. Systemic hormones act on estrogen receptor (ER) alpha/progesterone receptor (PR)-positive sensor cells. During ductal elongation, estrogen (17β-estradiol) induces expression of amphiregulin (AREG) that is activated by the extracellular protease ADAM17. AREG acts via the epidermal growth factor receptor (EGFR) on stromal cells. In response to this stimulation, the stromal cells release factors such as fibroblast growth factors (FGFs) and insulin-like growth factor-1 (IGF-1) that signal back to the epithelium, inducing proliferation. Other proteins are also induced by estrogen (E), such as LCN2, SLP1 and HbP17, but their biological function remains to be elucidated. During adulthood, in the presence of estrogens, progesterone (P) induces side branching. In response to progesterone, the ER/PR-positive sensor cells release several paracrine factors such as Wnt4, receptor activator of NF-κB ligand (RANKL) and calcitonin (CT), which act on neighboring cells, inducing proliferation and stem cell expansion. Ad, adipocyte; BM, basal membrane; CTR, calcitonin receptor; Fb, fibroblast; IC, immune cell; LC, luminal cell; MC, myoepithelial cell; RANK, receptor activator of NF-κB; TGF, transforming growth factor. Surprisingly, tissue recombination experiments revealed that AREG's cognate receptor, the EGFR, is not important in the mammary epithelium but is required in the mammary stroma [70–72]. Consistent with AREG produced by epithelial cells signaling to the stroma, stromal EGFR phosphorylation is decreased in the absence of epithelial ADAM17 . There are several candidates that may signal back from the stroma to ultimately trigger epithelial cell proliferation, foremost being insulin-like growth factor-1 (Figure 2). Expression of insulin-like growth factor-1 mRNA is restricted to the stromal compartment and can induce ductal elongation [73, 74]. Insulin-like growth factor-1 expression is also induced by estrogens in the mammary stroma of ovariectomized heifers , suggesting that this pathway is important and conserved across species. Further attractive candidate mediators of stromal-epithelial crosstalk in response to AREG-EGFR signaling are members of the fibroblast growth factor (FGF) family. FGFs are required for the branching morphogenesis in several organs including the lungs and salivary glands [76, 77]. Specifically, FGF2 and FGF7 elicit branching of mammary organoids in three-dimensional matrigel cultures even in the absence of EGFR signaling , and in vivo stromal FGF7 expression is induced upon E2 stimulation . Deletion of the cognate FGF receptor 2b in mammary epithelial cells results in delayed ductal growth during puberty. Remarkably, in mosaic FGF receptor 2b mutant epithelia the highly proliferative ductal tips consist almost exclusively of wild-type cells. This indicates that FGF receptor 2b is required for epithelial cell proliferation , which may be elicited by FGFs released from stromal cells in response to EGFR activation by AREG (Figure 2). Importantly, around the proliferative ductal tips the basal lamina that typically separates epithelial and stromal compartments is thinned out or absent, a circumstance that facilitates interactions between epithelial and stromal cells. Global gene expression profiling of mammary stroma after estrogen stimulation has revealed additional candidates that may signal back to the epithelium, such as a transforming growth factor beta extracellular inhibitor protein CAP-GLY domain containing linker protein 1, and thrombospondin 2 . Wnt4 and receptor activator of NF-κB ligand (RANKL) have been implicated as important paracrine mediators of progesterone function (Figure 2). Wnt4 is a secreted protein that belongs to the Wnt signaling pathway, involved in many developmental processes. Epithelial outgrowths derived from Wnt4-/- or wild-type mammary buds transplanted in contralateral cleared fat pads revealed that Wnt4 is required for side branching . Wnt4 mRNA expression is induced by progesterone, and depends on intact epithelial PR signaling. In situ hybridization studies revealed that the spatial distribution of Wnt-4 and PR mRNA are overlapping, suggesting that Wnt4 is expressed in PR-positive cells . RANKL is a TNF family member that activates NF-κB  and plays a fundamental role in antigen-presenting cells and during osteoclastogenesis . The observation that RANKL-deficient females fail to lactate first pointed to a role of this factor in the mammary gland . RANKL mRNA expression is induced in ovariectomized mice stimulated with progesterone , and depends on intact PR signaling as PRB-deficient mammary glands show decreased RANKL expression . RANKL protein is exclusively expressed in PR-positive cells in the mammary epithelium [65, 86]. Ectopic expression of RANKL or its receptor (receptor activator of NF-κB) in the mammary epithelium is sufficient to induce side branching in virgin mammary glands , and RANKL-/- mammary epithelia lack side branches and alveoli . RANKL is necessary for the extensive proliferation of HR-negative epithelial cells in response to progesterone stimulation . Transgenic RANKL expression in ER-positive mammary epithelial cells of PR-deficient females rescued the phenotype of PR knockout, unequivocally demonstrating that RANKL is an essential mediator of progesterone signaling . Another paracrine mediator of PR signaling is calcitonin (Figure 2), a 32-amino-acid peptide hormone involved in calcium homeostasis . Calcitonin expression is induced by progesterone in the luminal cells . The cognate calcitonin receptor is expressed in the myoepithelium, suggesting that calcitonin may act as a paracrine factor in a heterotypic interaction; its biological function remains to be defined . Taken together ER and PR nodes in the mammary gland involve paracrine signaling loops, with a strong involvement of the stroma in the case of pubertal ER signaling and possibly more crosstalk with myoepithelial cells in PR-driven epithelial proliferation. Mammary stem cells have been defined as cells with the ability to reconstitute cleared fat pads and were shown to be enriched in a basal cell population characterized by a cell surface antigen profile consisting of low levels of the glycosyl phosphatidylinositol-anchored protein CD24 and high expression levels of β1-integrin (CD29) and α6-integrin (CD49) (CD24+CD29highCD49high) [91, 92]. As these cells do not express HRs , it has been proposed that they are activated by hormones through paracrine signaling [63, 94]. Elegant fluorescence-activated cell sorting experiments revealed that the size of the stem-cell-enriched population depends on the hormonal status of the animal, increasing during diestrous and pregnancy and decreasing with ovariectomy and antiestrogen treatments [95, 96]. RANKL has been proposed to act as a paracrine mediator of stem cell activation- because expression of its cognate receptor, RANK, is enriched in the basal compartment [95, 96]. However, recent lineage tracing experiments indicate that luminally and basally restricted stem cells coexist in the postnatal mammary gland ; hence a factor that activates luminal stem cells remains to be ascertained. Global gene expression profiling studies on large sets of breast cancer samples have consistently revealed five different breast tumor subtypes (luminal A, luminal B, HER2-enriched, claudin-low, basal-like) . Luminal A and luminal B profiles represent ER-positive tumors. Comparison of different luminal/ER-specific signatures reveals major discrepancies and a limited number of genes that are repeatedly associated with the ER signature [11, 99–106] (Table 1). These genes include X-box binding protein 1 transcription factor, the LIV-1 subfamily of ZIP zinc transporter 9/solute carrier family 39 member 6, solute carrier family 1 member 4, solute carrier family 1 member 2, trefoil factor 1, trefoil factor 3, c-Myb, runt-related transcription factor 1, B-cell CLL/lymphoma 2 and stanniocalcin 2. Due to the heterogeneity in cellular composition of different tumors, the view is widely held that signature genes are highly expressed in the most abundant cell type within a given tumor - hence in the case of luminal tumors they are not necessarily related to ER function. Yet the strong correlation between GATA-3, forkhead box protein A1 (FOXA1) and ERα stipulated functional studies, which have revealed connections between these transcription factors and ERα function in the mammary gland and in mammary tumor models. Examples of studies identifying genes that characterize estrogen receptor alpha-positive breast tumors. The table shows genes that appear in more than one study. GATA-3 was shown to be expressed in the luminal cells of the normal mouse mammary gland and to be required to maintain luminal epithelial differentiation [107, 108]. Loss of GATA-3 resulted in a decreased number of ERα-expressing cells , suggesting that GATA-3 is up stream of ERα. In cell lines, however, estrogen stimulation results in an increase of GATA-3 transcripts, indicating that GATA-3 itself may be regulated by ERα . Furthermore, ERα binds to the GATA-3 gene in ChIP assays [110–113]. Accordingly, it has been postulated that GATA-3 and ERα are involved in a positive cross-regulatory loop, with each of them required for the transcription of the other . In the MMTV-PyMT mammary tumor model, GATA-3 loss marks progression from adenoma to early carcinoma and the onset of tumor spreading . Clinically, GATA-3 expression shows inverse association with histological grade and human epidermal growth factor receptor 2 expression  and has been validated as a predictor for response to hormonal therapy in ERα-positive tumors [115, 116]. FOXA1 is also important for mammary gland development [11, 102, 117]. Like GATA-3 or ERα loss, FOXA1 deletion from the mammary epithelium leads to impaired pubertal ductal morphogenesis . ERα expression is undetectable in tissue recombinants with FOXA1-/- epithelium engrafted under the kidney capsule, suggesting that FOXA1 is necessary for ERα expression . Besides, FOXA1 and ERα interact in the yeast two-hybrid system  and between 7 and 48% of genes recruiting ER have been suggested to also bind FOXA1 in MCF-7 cells [110, 120], whereas FOXA1 enhances the interaction between ER and chromatin [121–123]. FOXA1 expression in ER-positive tumors correlates with a good prognosis , and is inversely associated with tumor size, histological grade, lymph vascular invasion, lymph node stage and human epidermal growth factor receptor 2 over expression . FOXA1 and GATA-3 are also related to each other; ectopic expression of GATA-3 induces FOXA1 mRNA  and GATA-3 binds to FOXA1 promoter in ChIP assays in MCF-7 cells  and in the normal mammary gland , suggesting that FOXA1 is a GATA-3 target gene. Cyclin D1 is linked in multiple ways to ER/PR function. In the mouse mammary gland, cyclin D1 was shown to be required for proliferation of HR-positive cells in response to progesterone . Amplification and overexpression occurs almost exclusively in ER-positive tumors ; cyclin D1 and ERα are frequently coexpressed in ductal hyperplasias and in breast carcinomas [128, 129]. Within ER-positive tumors, cyclin D1 amplification identifies a group of women with poor prognosis . Trefoil factor 1 and trefoil factor 3 may be of functional importance as their overexpression accelerates tumorigenesis in xenografted MCF-7 and T47D cells [131, 132]. Interestingly, when T47D and MCF-7 cells are exposed to E2, the expression profiles between both cell lines shared several regulated genes and are similar, and some of them overlap with genes expressed in ERα-positive tumors . Furthermore, similar studies have shown that several of the ERα signature genes are upmodulated upon E2 stimulation in breast cancer ERα-positive cell lines, with estrogen-responsive genes including GATA-3, FOXA-1, cyclin D1, trefoil factor 1, X-box binding protein 1, LIV-1, stanniocalcin 2, B-cell CLL/lymphoma 2, and Myb [111, 134–140]. Interestingly, several genes identified as E2-regulated genes in MCF-7 cells (such as cyclin D1 and GATA-3)  are present in tumor-defined luminal/ER gene clusters and help to predict outcome in response to tamoxifen treatment . Global mapping of ERα binding sites through ChIP-seq has revealed sites in FOXA1 [111, 113], GATA-3 [111, 113], CCND1 [111, 142] and Runt-related transcription factor 1 . Interestingly, ERα also binds to AREG , which is an important mediator of ER function in pubertal mammary gland development and is regulated by E2 in breast cancer cell lines . AREG is not part of the luminal signatures but nevertheless may still have a role in breast tumors, possibly early in breast carcinogenesis when paracrine control mechanisms are still intact that might be lost later during tumor progression. Global ER-binding events were mapped recently for the first time in tumor samples . Excitingly, this study revealed signatures that predict clinical outcome. In most cases, PR-positive tumors also express ER and are studied within the ER-positive tumor group. Based on global gene expression studies on T47D and primary human bronchial epithelial cells , expression of RANKL and Wnt4 is not regulated by progesterone [55–57], yet PR has been shown to bind to the Wnt4 promoter by ChIP assay in T47D cells . Clinically, 27% of primary tumors express receptor activator of NF-κB . RANKL expression was found in 11% of human invasive breast carcinoma , suggesting that the pathway may be active. Similarly, a role for Wnt signaling in breast cancer is suggested by the finding that extracellular inhibitors of the pathway such as secreted frizzled-related proteins, Dickkopf-3, Wntinhibitory factor-1 and the intracellular antagonist of β-catenin, adenomatous polyposis coli, are epigenetically silenced in breast tumors [148–154]. Hence, these paracrine factors and the signaling they elicit may have a role in breast carcinogenesis. HR-positive cells in the mammary gland act as sensor cells; they detect the systemic requirements reflected in hormone levels and translate them into local commands. The molecular underpinnings of this switching station are ERα and PR and their signaling nodes. Mouse genetics have established that in vivo paracrine signaling is of central importance to coordinate the behavior of luminal and stromal cells (ER) during puberty and of luminal and myoepithelial cells (PR) in the adult mammary gland. In vitro experiments with ER-positive breast cancer cell lines have revealed that these receptor-signaling nodes coordinate the actions of distantly acting endocrine signals with locally acting receptor tyrosine kinase and G-protein-coupled receptor ligands that ultimately modulate transcription. At least for ER we now know that the vast majority of its genomic action occurs through distant control elements. Despite the limited overlap between the nodes emerging from the distinct approaches in breast cancer cell lines, during mammary gland development and in breast tumors, the EGFR pathway appears tightly linked to ERα and PR signaling at different levels. There is continuous crosstalk between EGFR and HRs  by nongenomic mechanisms, and in vivo the EGFR ligand AREG is an important paracrine mediator of estrogen action. AREG is also implicated early in breast carcinogenesis, as it was the most upregulated gene in a comparison between hyperplastic enlarged lobular units and normal terminal duct lobular units . A major challenge remains to integrate the information acquired from the different approaches. Whether the intracellular signaling cascades triggered by hormones in cell lines work similarly in vivo remains to be determined. Increasingly sophisticated fluorescence-activated cell sorting-based cell separation approaches, laser capture dissection as well as in vivo signaling/imaging approaches should help to connect the currently separated views of ERα/PR signaling, taking into account that they operate only in a minor subset of cells in vivo. This work was supported by NCCR Molecular Oncology, SNF (SNF grant 31003A). TT was the recipient of a Marie Curie Incoming international fellowship and LJR received a fellowship from the Government of the Basque Country.